Surfinia Petunia produces an unending display of incredible colour from April until October! Bred and developed to produce the biggest, best and longest displays. These trumpet shaped flowers even have a gorgeous sweet fragrance. 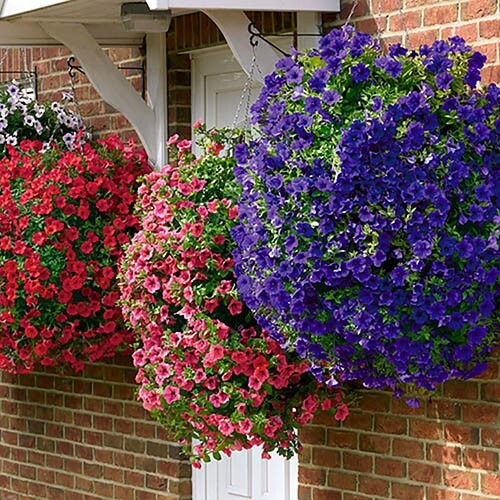 Vigorous and low maintenance, disease resistant and also very weather resistant. 'Surfinia' Petunia has been the Number 1 Summer flowering trailing Petunia for over a decade now, such is its ability to produce an unending display of incredible colour from May until October, flowering all along its trailing stems! It has been bred and developed to produce the biggest, best and longest display of any variety and its trumpet shaped flowers even have a gorgeous sweet fragrance. It's no surprise our Customers vote it in their Top 3 every year too with their orders. On top of its flowering ability, it is also vigorous and low maintenance, disease resistant and also very weather resistant. It is because of all of these positive attributes you see it planted in so many professional displays! Plant 'Surfinia' Petunia in any hanging basket or container with enough height for it to trail (its trails can reach over 90cm (3ft) long!) or even in beds and borders where it will provide a colourful summer ground cover, smothering any weeds that try to grow.